July 9, 2012 — A couple of weeks ago I went on road trip with destinations in Maryland, Virginia, and North Carolina. It wasn’t technically an oddity hunt, nor technically a vacation. The first two states were about visiting family. The third was because my wife had a photography assignment there. Of course, that’s not to say I didn’t do any oddity hunting or vacationing throughout. In fact, I did plenty of each. But instead of cluttering everybody’s Facebook feeds with rivers of photos, I decided to limit myself to one post per day on the OTIS Facebook page, each one made up of a collage of three photos that attempted to sum up my entire day: My day in three frames. And I mostly stuck to it. I was able to do it for all 12 days I was away except one, and only two or three times was I moved to post an additional individual random photo from my day. June 22: Found a snakeskin for a curio cabinet I've yet to buy, flew a dinosaur kite I got for my birthday a couple of months back, and caught frogs. Because that's what I do at my folks' house. June 23: I firmly believe that catching a live snake is resume-worthy, even if it's just a garter snake. I have three taste buds, two of which are dedicated to Maryland Blue Crabs and the third to Old Bay seasoning. And we celebrated my niece's first birthday. June 24: Got to visit three oddities on this day, a church-turned-cafe called Beans in the Belfry (which I've already posted about), Crystal Grottoes Caverns in Boonsboro, and the 50-year-old John Brown Wax Museum just over the state line in Harper's Ferry, WV. Those latter two have OTIS entries forthcoming. June 25: Spent the day in Baltimore, where these days it's uncertain whether images of ravens are meant to honor Poe or the local NFL team. Of course, I try to visit Poe every time I'm in town. And then, among a few other cemetery jaunts, I posed on the platform that once bore the cursed statue, the Black Aggie. 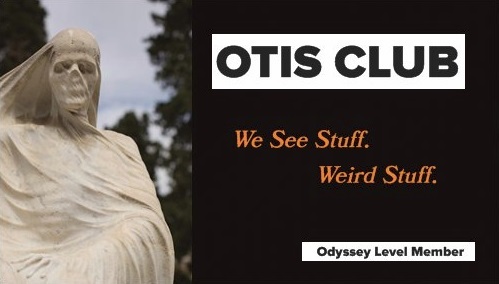 It's the last site of four that I needed to visit for an OTIS post that I've been putting together since before there was an OTIS. June 26: In Virginia, where I visited an old town jail turned museum, peered through a hole in a retired train car, and met an emu...because southern hospitality demands that one stops and says "hi" when you see an emu near the side of the road. June 28: On the way to the Outer Banks of North Carolina, I stopped at a still-standing slave auction block in Fredericksburg, saw a massive statue of Neptune at Virginia Beach (which I've also already posted about), and then topped it off with dinner at a shark-themed restaurant in Kill Devil Hills, NC, called Mako Mike's. June 29: The path to the beach is paved with good intentions. There, I became an expert at catching mole crabs, also resume-worthy, in my opinion. We then went to Roanoke Island, site of the infamous Lost Colony, and visited a permanent outdoor stage where they've been performing a play based on the mystery for the past 75 years. June 30: Visited the Wright Brothers memorial, on the exact spot where they changed the world, found my first ever mermaid purse, and had dinner at a Mexican restaurant with a large desert lizard in its foyer. July 1: Spent the entire day on Ocracoke Island, the site of the Blackbeard's death. There, among other sites, I checked out a Blackbeard-themed gift shop, saw one of the oldest continually operating lighthouses on the East Coast, and met some of the Outer Banks' famed wild horses, although these guys had been domesticated at some point. July 2: On our last full day in NC, we said goodbye to the beach at sunset, where some dolphins returned the farewell, and then went back to Roanoke Island to visit its small, but impressive, aquarium. July 3: Woke before the dawn for the 12-hour road trip home to New Hampshire, but still found time to stop in Delaware to see a 34-foot stainless steel statue of Mary. And, in conclusion, Popeyes. You'd think that 33 pictures would be plenty to sum up a 12-day trip, but looking back on them all in macro like this, there were quite a few oddities and experiences that I had to leave out to meet my "three frames" criteria. Those are stories for other days, I guess. Still, after doing it for almost two weeks, I gotta say it was a great way to frame up each day. Of course, it’s not something I’d do regularly, since most of the time, I’d only be able to post screen caps of television shows.